The article and accompanying photo essay were first published in Elementum – Edition One. Cadgwith (Cornish – Porthkajwydh) is a small fishing village gathered around a natural harbour on the south-east coast of the Lizard Peninsula in Cornwall. The origins of the village are steeped in medieval times when local farmers built fish cellars to store their catch close to the cove. At that time, fishing was used to supplement the livelihoods of a predominantly farming community. It was known then as Porthcaswydh, Old Cornish for ‘cove’ and ‘thicket’ – most likely named because the valley leading down to the cove was heavily wooded. The literal translation of ‘thicket’ from Cornish is ‘a battle of trees’ so Porthcaswydh could be translated, ‘Tree-Battle Cove’. Inhabited from the 16th century, it grew as a fishing village and became known in the Late Cornish period (late 16th to early 19th century) as Por Cadjwydh. Until the 1950s pilchard fishing was the main occupation. Today the catch is largely crab, lobster and monkfish. The waters around the Lizard can be treacherous and many lives have been lost off its shores. Between 1867 and 1963, the Cadgwith lifeboat was manned by local fishermen. 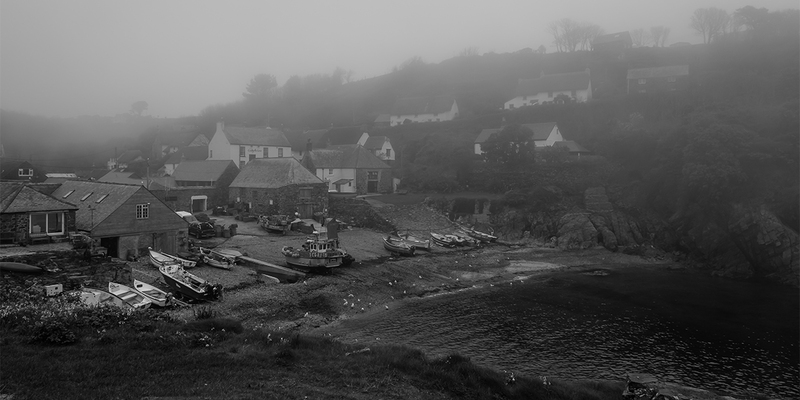 In 1961 the Cadgwith service amalgamated with the Lizard lifeboat service, moving to a new station at Kilcobben Cove further south on the peninsula. The old lifeboat station at Cadgwith now houses the local pilot gig rowing club. Today, houses and cottages, many built from the local stone (a dark-coloured serpentinite), rise up the steep slopes of the valley behind the shingle cove. Fishing-related buildings include a winch-house, fish-cellars, boathouses and sail lofts. There is a simple and atmospheric church dedicated to St Mary made from corrugated iron and painted blue. About a quarter of a mile to the west there is the holy well of St Ruan. A rocky promontory called ‘The Todden’ divides the beach into two. The working beach, Cadgwith Cove or Big Beach, lies to the northeast. The beach on the southwest side is smaller and sandier. This is Little Cove, used as the swimming beach by locals and holiday-makers. A natural passage through The Todden connects the two beaches. Cadgwith is sheltered from prevailing winds from the South West or West, but easterly or south-easterly winds can produce rough seas with waves sometimes sweeping up the cove and into the village.